The identification of anxious symptoms is crucial to diagnose anxiety disorders, as well as to monitor their treatment in clinical practice and research. The aim of this review is to discuss the different ways of assessing anxiety in clinical research, including clinical trials, and the different kinds of animal behavioral tests used to study anxiety and test the efficacy of anxiolytics in pre-clinical studies. In clinical practice, a categorical classification (such as the Diagnostic and Statistical Manual of Mental Disorders and the International Statistical Classification of Diseases and Related Health Problems) distinguishes the cases of the disease versus non-disease. Some structured and semi-structured interviews can be used to arrive at these diagnoses. On the other hand, anxiety can also be assessed using a dimensional approach, through self-report or hetero-evaluation questionnaires. Regarding the assessment of anxiety in animals, several behavioral tests are described and evaluated, namely the Social Interaction Test, Elevated Plus Maze and Open Field Test. Under a critical view, these two approaches are presented and discussed, in order to improve the outcome of research in this field. Keywords: Anxiety evaluation, Screening tools, Validation criteria, Animal models, Behavioral pharmacology, Elevated plus maze, Open field test, Social interaction test. Keywords:Anxiety evaluation, Screening tools, Validation criteria, Animal models, Behavioral pharmacology, Elevated plus maze, Open field test, Social interaction test. Abstract:The identification of anxious symptoms is crucial to diagnose anxiety disorders, as well as to monitor their treatment in clinical practice and research. 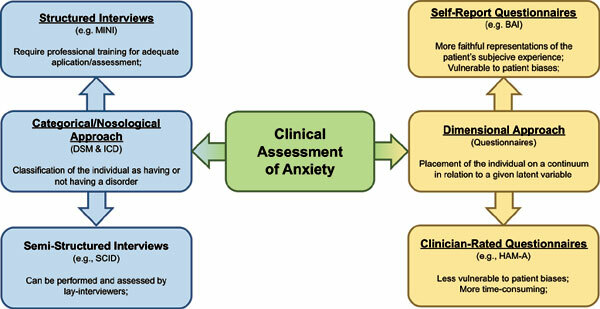 The aim of this review is to discuss the different ways of assessing anxiety in clinical research, including clinical trials, and the different kinds of animal behavioral tests used to study anxiety and test the efficacy of anxiolytics in pre-clinical studies. In clinical practice, a categorical classification (such as the Diagnostic and Statistical Manual of Mental Disorders and the International Statistical Classification of Diseases and Related Health Problems) distinguishes the cases of the disease versus non-disease. Some structured and semi-structured interviews can be used to arrive at these diagnoses. On the other hand, anxiety can also be assessed using a dimensional approach, through self-report or hetero-evaluation questionnaires. Regarding the assessment of anxiety in animals, several behavioral tests are described and evaluated, namely the Social Interaction Test, Elevated Plus Maze and Open Field Test. Under a critical view, these two approaches are presented and discussed, in order to improve the outcome of research in this field.